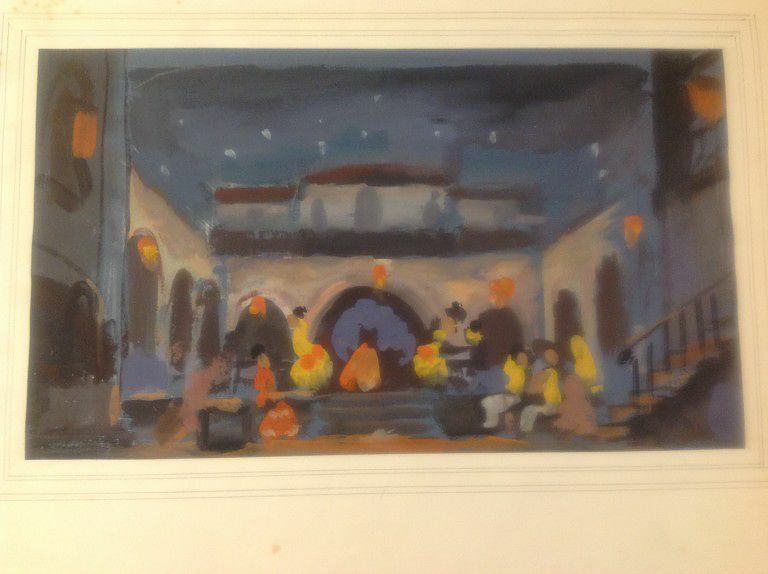 This set design is by Morris Kestelman (1905-1998) for Bizet's opera Carmen. Kestelman was commissioned by Tyrone Guthrie in 1939 to design both sets and costumes for the production at Sadler's Wells Theatre which Guthrie ran. Carmen opened in February 1940, one of several operas that were performed in repertory at Sadler's Wells during 1939 and 1940. It was a struggle to continue productions during wartime; staff all accepted salary cuts as high as 50%, and to celebrate the achievement of mounting opera there during wartime, a 'jubilee performance' celebrating the 50th performance of opera since the war began took place at Sadler's Wells on 31st January 1940. 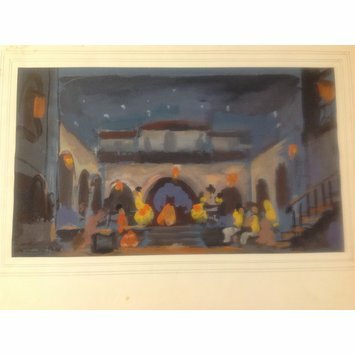 Morris Kestelman (1905-1998) is best known as a painter, but made a significant contribution as a stage designer during the 1940s when he also designed Tabbaro and Gianni Schicchi for Sadler's Wells, and Richard III, The Alchemist and Doctor Faustus for the Old Vic. Watercolour on card ground plan designed by Morris Kestelman for Carmen, Sadler's Wells Opera Company, 1940. The design shows people watching others on stage in front of archways.